Eco-adventure in the heart of Southwest Florida! Just a few miles from the popular sugary sand beaches of Naples, Florida, rests thousands of acres of untouched terrain filled with native wildlife. Orange Jeep Tours is one of the top-rated tours on Trip Advisor in the Naples/Ft. Myers area giving visitors the chance to glimpse rare animal species, discover local history and folklore, and have fun while enjoying a 90-minute narrated Jeep tour. It’s a fun activity for the entire family. Daily jeep safaris depart from the Ave Maria Town Center, just minutes from Naples and Ft. Myers, and give adventure seekers the opportunity to see such native wild life as American alligator, Whitetail deer, Osceola turkey, Florida Red-Bellied turtle, and a large variety of bird species. 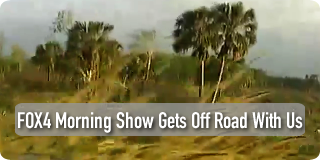 Featured on ParadiseCoast.com as local area jeep safaris. Book your adventure today! All ages are welcome. Call us at 239-434-JEEP. 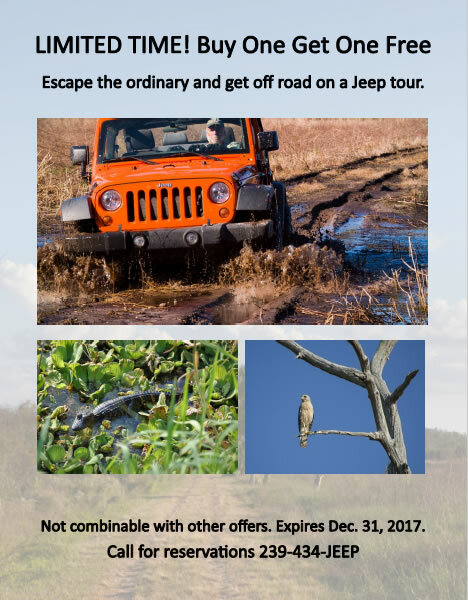 Orange Jeep Tours is the first offering from Collier Adventures, an outdoor adventure company based in southwest Florida. Orange Jeep Tours opened in early 2012 to rave reviews giving tourists and locals the opportunity to journey through miles of never seen before private terrain. Owned by the founding family of Collier County, this land is preserved and protected in perpetuity under the Florida Rural Land Stewardship program. The Collier family honors their great-grandfather’s adventurous spirit and legacy by sharing this piece of swamp paradise with all ages. Our eco-safari adventure is a great outdoor activity for the entire family.